Utility: Steam,Hot Water,Electrical heater,Thermic oil or hot air. Sizes available : 100 L to 20000 L.
- Mechanical seal for inlet & outlet of hot media. - Vapour filter with high filter area & easily detachable function. Our organization is very well known in offering Rotocone Vacuum Dryers to our clients. The Rotocone Vacuum dryer with improved technology integrates drying operation under vacuum. The Rotocone Dryer Facilitates enhanced drying efficiency, low temperature and economy of process by total solvent recovery. 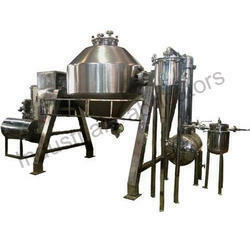 - Offers simple and effective method of drying wet cakes and sometimes slurries. - Reduces drying time and eliminates need of re drying of lumps. - Shaft sealing by mechanical seal, offers optimum and continuous vacuum during process. - N2 pulse jet dust filter for better operational efficiency. Our offered Rotocone Vacuum Dryer (RCVD) is suitable for drying of material, which cannot resist high temperature and material. 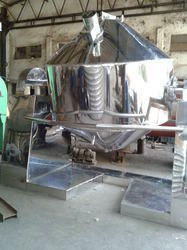 These products are made by skilled workers employing high quality raw material and latest machines. All these products are checked on well defined parameters before the final delivery to the customers. - Continuous measurement of various process Parameters in the drying room. - Pressure part conforming to ASME & other International Design Codes.